The Longest Cave System In The World Is Found In? 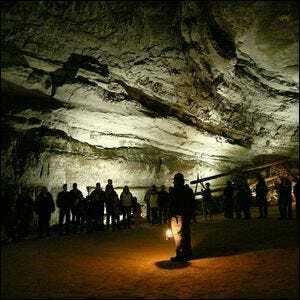 Around the world, you’ll find big cave systems, bigger cave systems, and then you’ll find Mammoth Cave, formally known as the Mammoth-Flint Ridge Cave System—named after the geological ridge under which the system has formed. The Mammoth Cave System is so large, at 405 miles (652 kilometers) of surveyed passages, that it not only dwarfs the next largest known cave system (it’s more than twice as large as the 198 mile/319 kilometer long Sistema Sac Actun, or White Cave System, in Mexico), but its lead continually grows. Despite centuries of modern explorers spelunking the depths of Mammoth Cave, a few miles, on average, are discovered every year, adding more weight to Mammoth’s title as king of the cave world. Not only is Mammoth Cave notable for its sheer size, but it’s a stunning geological gem encompassing vast and varied structures that have captivated not just the visitors of today, but visitors dating back into prehistory—evidence and artifacts from the cave system indicate humans have been visiting and using the caverns for approximately 6,000 years. In light of all that, it’s no surprise that the sprawling mega complex of caverns is honored as a U.S. National Park, a UNESCO World Heritage Site, and a UNESCO Biosphere Reserve. One thing Mammoth Cave isn’t notable for, however much the name might imply it, is woolly mammoth bones—the name is a reference to the mammoth (as in huge) main chambers of the cave system. If you want to see a site of mammoth bone discoveries, you won’t have to travel far though. Located in the same state as the Mammoth Cave System is Big Bone Lick State Park, where numerous woolly mammoth skeletons have been discovered over the last two and a half centuries. Image courtesy of Daniel Schwen.